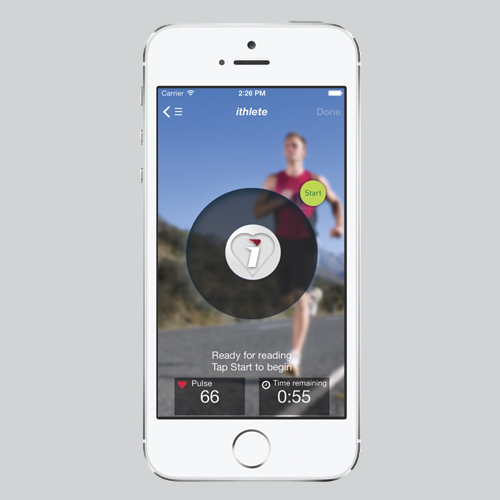 For anyone who enjoys competitive sports, ithlete is the only iPhone or Android app that accurately measures, predicts and adjusts a personal training regimen to maximise your athletic performance whilst maintaining excellent health. 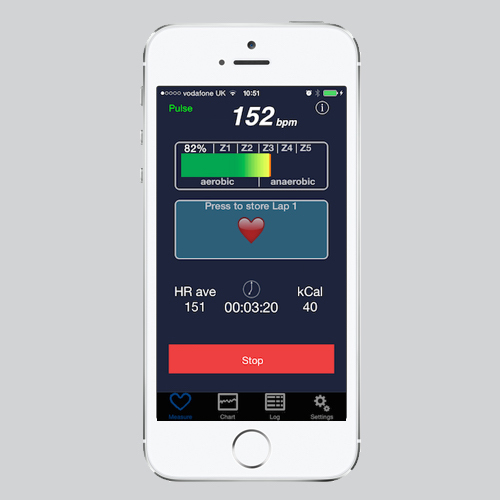 The ithlete app measures your HRV whilst you breathe in a relaxed way and presents the results in a convenient colour coded way that is stored for tracking. Enjoy your rest days – you know you’re getting fitter! The idea is quite simple. Take a 1 minute measurement every morning and train as normal. If your reading drops significantly, take this as an early warning that you are overloading the system. A small drop is OK as long as you recover. Training is all about stress and recovery and a hard session will lower your number. But if it stays low even with rest you could be on the edge of trouble. 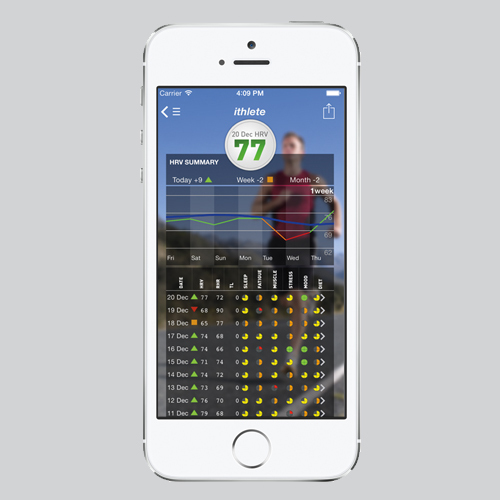 Using ithlete daily to monitor training stress is the best thing you can do to make your training safe and effective. Monitoring Heart Rate Variability, so much more valuable than just heart rate. Most fitness enthusiasts know that you don’t get fitter during exercise, you get fitter recovering from exercise. Judging the right balance of training load and recovery is a challenge even for experienced athletes. 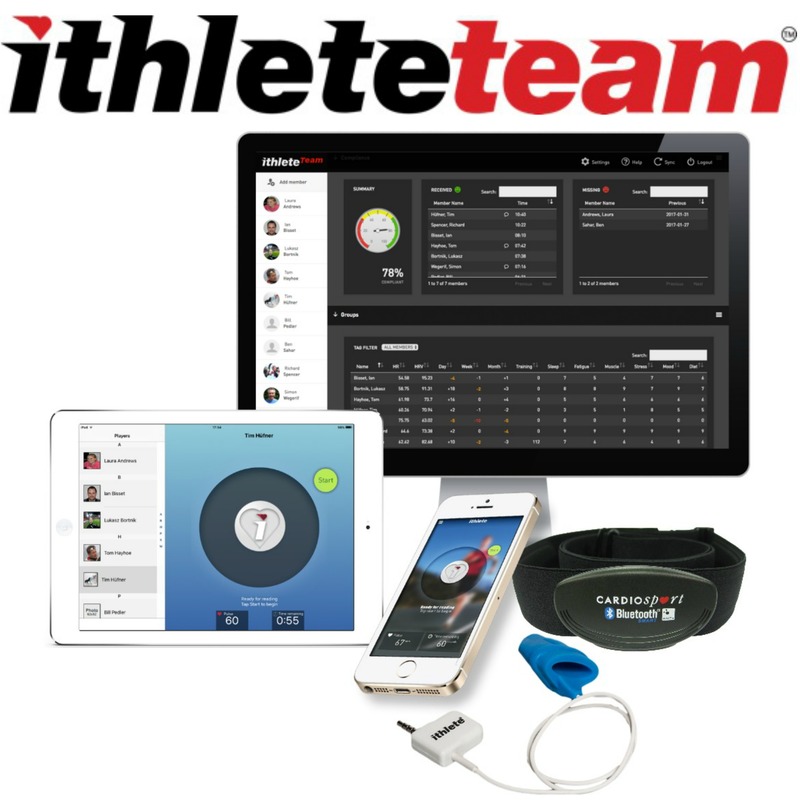 Measuring and tracking your individual daily fatigue and recovery level is the principle behind ithlete. The human heart is a great barometer of overall physical and mental condition. Everyone knows that your heart rate gets faster when you exercise. What a lot of people don’t know is that there is information in the way your heart beat intervals vary at rest that can be captured using heart rate variability (HRV). Increased HRV is linked to good health and a high level of fitness, whilst decreased HRV is linked to stress, fatigue and even burnout. 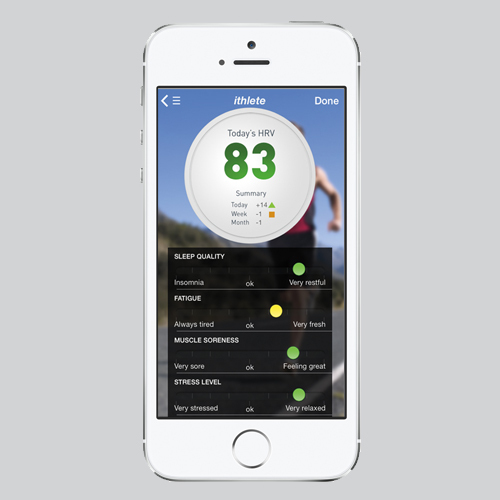 The ithlete app measures your HRV whilst you breathe in a relaxed way and presents the results in a convenient colour coded way that is stored for tracking. 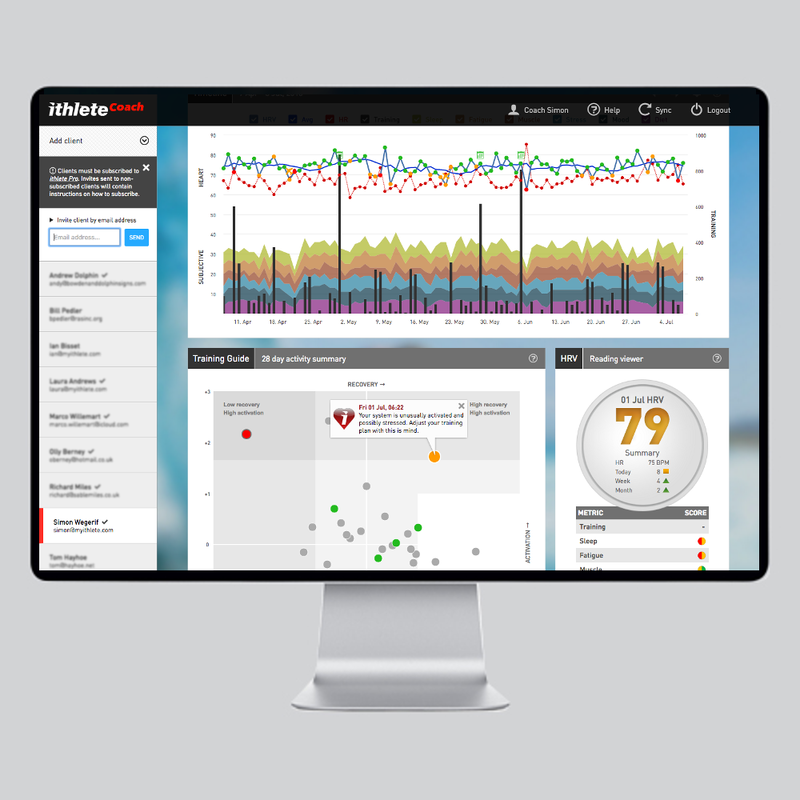 The ithlete heart rate variability (HRV) app has been downloaded by over 20,000 users and is praised by many well known publications. This is a great APP if you have a suunto t6c or heart rate monitor like this you need this little app, it does a great job on telling you how your training is affecting your body and helping you gauge your recovery, along with coaching software you are fit to go, i love it and use it every morning. Great app that does just what it says and really great service. Emailed my iTunes receipt and the receiver arrived the next day. Really great indicator for knowing when you should and shouldn’t train. I know that sometimes I train when I probably shouldn’t and this is good for telling me when those times are. Perfect app for overtraining The new version rocks for the android version (i use the galaxy s). Much more reliable then the earlier versions! Having recently read the Cyclists Training Bible I now understand the importance of rest. Training day after day when you’re fatigued is counter productive. This tool takes the guess work out of when your body is undergoing physical stress and for me, anyway, the results are sometimes revealing. I’m not always tired when I think I am and on those days I can push it a bit harder. I’d go as far as to say it’s a must have tool for any serious athlete. New Android version a dream! I recentley updated to the latest version of the android app running on Galaxy S and the difference is just astounding! No more difficulty in taking readings. To all the team at Ithlete, thanks keep up the great work. A really easy tool to ensure that you do the optimum amount of training every day. Great update to app. Particularly like the display of HR prior to the test and the recording of readings to display on chart at different times of day. I’ve had this app for over 12 months and I find it incredibly useful in directing my training sessions and being kinder to myself when the HRV drops dramatically (well at least sometimes!). This week it has been particularly interesting as I had a very high score on Tuesday after several days of consecutive training but Wednesday it plummeted and so I did a very light shorter session paying heed to the amber line, Thursday morning it had gone into the red & by the evening a cold had descended. The interesting thing was I rested Thursday & Friday because it dropped again&red lined and by now I had a full blown cold which continued into Saturday with seemingly worse symptoms but Saturday the score rate shot back up into the 70s so despite the streaming cold, I decided to do a session outdoors; I felt up to it and my reading in the morning had been so good. I felt great afterwards and within 2 hours my cold had completely dried up! I thought this was particularly interesting as if I had just responded to the symptoms and not known about my HRV I might have trained on the Thursday and probably wouldn’t have trained yesterday! This app is well worth the price if you want to develop an informed training schedule to maximise your ability to improve your fitness & endurance levels. I’ve been using this for 5 months now – as a road cyclist, that’s the period of ramping from winter tickover into hard riding. It took me a while to learn to get consistent readings but I have learnt an awful lot from the sophisticated feedback from this simple App. Generally, it helps me to understand my physiology better. There are times when it spots trouble before I know it. Now for example: my HRV reading has been surprisingly low for 3 days and today a full-scale cold has descended on me. A few months ago I learnt that my father had died. It wasn’t a shock and I felt quite quite calm about it. The iThlete however showed my HRV had dropped drastically for two days. Watching the thin blue line steadily climbing over the weeks and months is a powerful motivator. And the more thoughtfully you choose your rest, the stronger the effect. A fantastic App if you’re serious about monitoring your body under training stress. I have had the ithlete for over 6 months now and I find that I rely on it heavily. I had not used the HRV method before and just used to train through all illness and if I was tired. As a result I never seemed to get much fitter. Now, I take a great deal of notice, the ithlete even can show when I have a cold starting! Highly recommended as it helps you train smarter, and it does exactly what it says it does – for a fraction of the cost of other HRMs. I’ve been using ithlete for 8 months and it has really helped my training and my racing results have shown massive improvements. I regularly train 15 hours a week on average and I plan this training in advance. I use ithlete to track my recovery and will modify my plan accordingly. I did use resting heart rate as a guide before using ithlete but I often found this conflicted with how I felt and how my training went that day. More often than not, I’ve actually managed to perform more ‘harder’ training sessions based on the reading from ithlete and rest at the right time. Before ithlete, I did use to fall into the trap of overtraining and suffered as a result. Ithlete is very easy to use and understand. An auto-upload facility to online training diaries or a way to get the data out into a spreadsheet would make it perfect. I have used this for over 2 years now and I love it. It definitely let’s me know when I need more recovery. Before I was following a regime with intense interval training, an active recovery day and then more intervals or really long bike rides. I was getting stronger, but, I also felt tired. This takes into account my late night activities as well as my workouts. I feel stronger and am able to go harder on my interval days and I take my active recovery days based on this application and not a fixed schedule. It is easy to use, my resting heart rate is in the low to mid 40’s and I take the measurements sitting down to get the heart rate up to over. Doing it the same time of the day is a bit hard (impossible given the difference in wake up times between weekdays and weekends. I got stomach flu for 2 days and my numbers dropped like a stone. So, it felt nice to know I wasn’t supposed to workout (even if I couldn’t). It now has the ability to add noted. Perfect. The new calibration before you take the test seems to have really improved the consistency of the readings!! I’ll update the review again in a month but I can tell already! Love that you can add in your TRIMP scores it really helps to see if there is a correlation between HRV and the intensity of your previous workout. 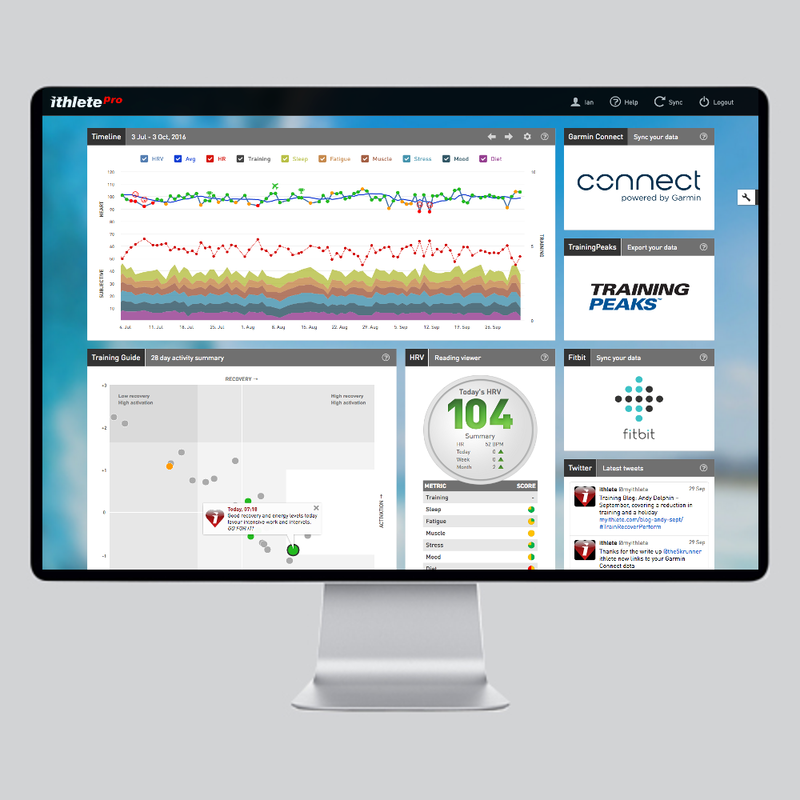 The only application that allows you monitor HRV…an extremely valuable life and training tool. It simply tells you the state of your physiology and you take it from there. Train, ramp it down a notch or take the day off based on your own physiology. The only thing to add to this app is the ability to add a note in order to know what was the possible cause of low or high HRV for the day… lack of sleep , poor nutrition, mental stress etc, rather have to keep the data separate in a training journal. I have found this program to be very helpful in guiding my training for powerlifting. I use it to gauge whether to push all out, take a medium day, or take a day off all together. I bought both iphone apps, a heart rate monitor and receiver from HRV Fit. The original heart rate monitor was not working properly but their customer service was amazing and they immediately personally tested and shipped out a new one to me. The apps work incredibly well. The Ithlete is outstanding; it gives a reading every morning that shows how hard you should train that day. The charts show daily, weekly and monthly progress based on your rest, recovery, sleep and intensity of your previous workouts. 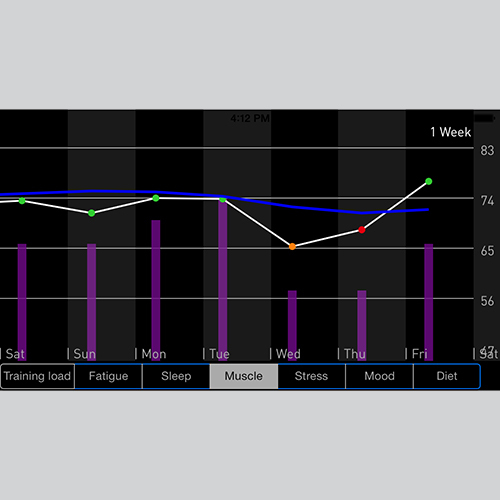 The other HRM app by HRV Fit is also amazing especially when you go into chart mode. This is the tool I have dreamt about for years. I am praying they will soon come out with an app that puts all the data together in a simple to use xcel or numbers spreadsheet. In the meantime, I will keep using the only two apps I have ever paid money for. I’m starting to use this for my training, and I am very optimistic! It will help me know where I am at every day, and I will be able to push myself accordingly. MAKE SURE YOU HAVE THE PROPER EQUIPMENT TO GO ALONG WITH THE APP, OTHERWISE IT IS USELESS!!! I am very happy with ithlete as it made a great differance in my life. Great app!!! Tremendous to see the performance levels of your body and when you need to recover!! Would recommend for any fitness individual at any level! Train Smart! I have been using ithlete for almost a year now. It gives me the essential feedback I need to make adjustments in my training. I am a long track ice speed skater. I cross train using weights, bike, slide board, yoga, swimming, and of course skating. ithlete helps me balance all of my training so I can know when to go hard or back off and rest. Thanks for the essential training tool! I have been an ithlete user for a little over a week now and each day I am a little more amazed at its accuracy based on what I already know about myself. For example, last Friday I had two speed workouts along with yoga, weightlifting, and a long walk. The next morning, ithlete showed I needed to take it easy. Fortunately, by Sunday ithlete said I was good to go for my long run and I was able to do my first 20 mile training run for an upcoming marathon. The only consumer device I know that provides this sort of information is a Polar RS800 for around $350 and ithlete is much easier – 1 minute every morning. In the past, if I wanted to know if HR was responding to training, I did a 5 minute Fit Test on a treadmill or every few weeks ran 5 miles at a steady pace. I think I can get the same information from ithlete just from putting on a strap first thing in the morning. BTW, I am not new at this. I am a 69 year old runner and geek who has been running most of my adult life and have tried just about every fitness gadget that has come down the pike. I think ithlete is going to be really useful and I wish it had been available a long time ago. I’ve been using this everyday now for 3 months. I train on bike 4-5 times a week and like to ride hard on at least 2 of these days. I’ve found this app provides an indication of how rested I am and if I should go easy on days when I might otherwise go hard. I have still trained hard now and again when told not too and had no problems hitting the power ints planned, but this is overload and I certainly pay for it the next few days! So it is handy as an early warning of overtraining. You do need to train frequently to make this useful not just 1-2 times a week. I can’t help to test myself 2 or 3 times in the morning to verify the score and sometimes it does vary quite a bit but I tend to use the score with the lowest heart rate to ensure I’m calmest. I had a high score the other day and it went to green but I was feeling very tired so I retested and the same score came up but it changed to red as my heart rate was extra low (supposedly meaning I’d overtrained), so I took the second reading asnd had the day off, luckily! I’d recommend it if you’re a serious athlete interested in getting an idea of your bodies rest level on a daily basis. Simple and fast. The perfect way to protect against over training and to let you know when you really should train, even if you don’t feel like it! Galaxy s 2 not working Not working for S2. NEW addon or old. If you can ignore the interface and little display issues that should actually be fixed, it’s not bad. It doesn’t crash. It does provide you an HRV number, so I guess that’s something. Ithlete has long been part of my daily routine. And I would recommend it to all athletes. However it is also the last app on my phone to be upgraded to fit my iphone 5 screen. Is this too much to ask? It’s not like its a free app. the potential for this device and app combination are incredible. that said, the app disappoints at preset. the data input screen is woefully inadequate, and doesn’t allow for user customizable input. this greatly limits the usefulness of the data output for those of us who are elite athletes or coaches. worse still, the csv output files contain data that are garbled thanks to the way the app interprets punctuation in the comments. and why I training load entered on a separate screen from the rest of the data? terrible planning of the app and GUI in that sense, and poor planning for the logistics of the data component as well. this could easily be a 5-star app with some minimal planning and talent on the programming side. alas, at present it is not. come on ithlete! force me to upgrade my rating!! Don’t make the mistake I did and not read all of the details of the app. You need to buy an ithlete receiver to use the app (£31.99 on their website). From the reviews I’m sure it’s great but I’ve just put 7quid down the drain because of my own stupidity! It’s one of the greatest tools for gauging recovery out there. Applicable to all athletes, and levels of ability. 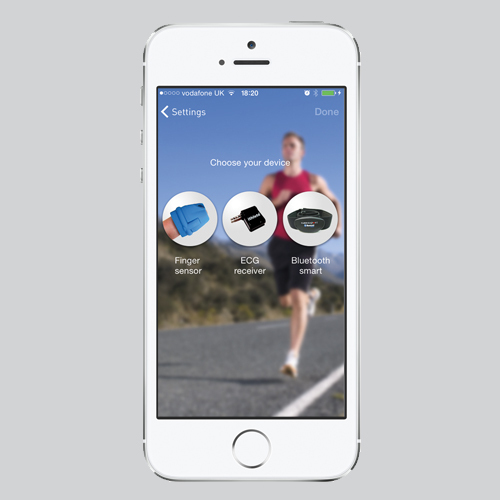 It can teach you how to be aware of how you’re body is recovering from training efforts, if you use the app daily. It will promote better fitness and performance. I love it and have been using it daily for 1.5 years now, and really appreciate the advancements taking place in the industry that allows such information to be available to athletes at all levels of fitness, inexpensively. Have tried the trial subscription, both revealing on some days and confirming on others! Very helpful. Glad you liked it Sharon!